WASHINGTON—Anti-worker GOP President Donald Trump’s Labor Department and his new Republican majority on the National Labor Relations Board have jumped into the long-running debate over whether a big corporate headquarters – think McDonald’s – should be jointly responsible with its franchises for obeying or breaking labor law. Their joint answer: In almost all cases, no. 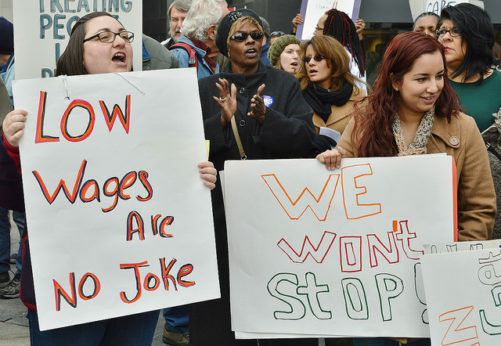 And their joint plans could leave millions of workers – restaurant workers, retail workers, warehouse workers, chain motel workers and more – bouncing from pillar to post to find someone either to bargain with or to blame for labor law-breaking. The actions by the two agencies are no great surprise, as they’re the latest in a lengthening line of Trump NLRB and DOL agreement to enact corporate anti-worker wish lists. Advocates of a stronger joint employer rule – led by the union-backed Restaurant Opportunities Center – had no immediate comment on the proposals. DOL’s proposed joint employer rule, officially published on September 14, was disclosed two days before by Labor Secretary Alex Acosta in a speech to a hotel owners group. And the Trump-named GOP NLRB majority issued its plan on September 13. Not only that, but both planned rules mimic legislation the GOP-run House shoved through last year, letting almost all joint employers off the hook. “Under the proposed rule, an employer may be…a joint-employer of another employer’s employees only if it possesses and exercises substantial, direct and immediate control over the essential terms and conditions of employment and…in a manner not limited and routine,” the GOP board majority said. Indirect influence and contractual reservations of authority would no longer be sufficient to establish a joint-employer relationship,” it added. The NLRB voted 3-1 on party lines to seek comments on its plan, with an October 28 deadline. Acosta used virtually the same language in his speech to the retailers, who lobbied fiercely against a tougher Obama-era NLRB joint employer rule – a rule dumped soon after the anti-worker construction magnate entered the Oval Office. The NLRB’s proposal overturns a 13-year-old ruling involving Browning-Ferris Industries and the union trying to serve workers at one of its franchises. That gave workers a limited chance to prove that both corporate headquarters and local franchise holders are jointly responsible for obeying or breaking labor law. 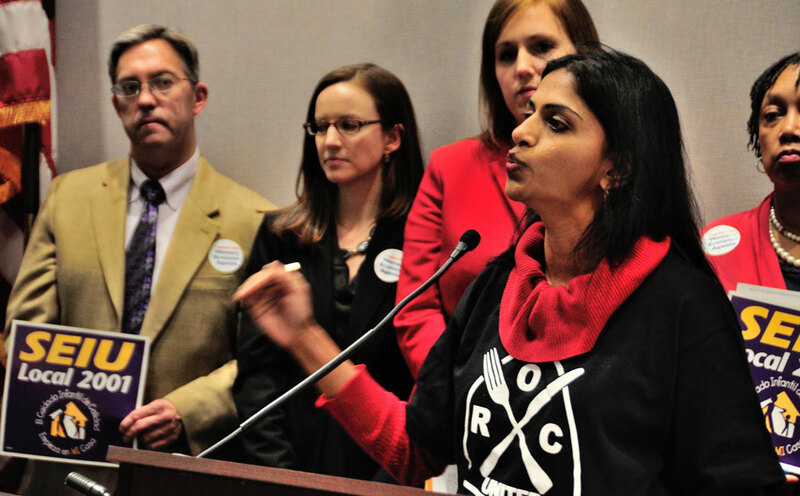 Union-backed ROC and its allies contend that if the corporate headquarters control everything from prices to uniforms to – in fast food restaurants – the size of servings, then headquarters and local franchises should be jointly responsible for labor law, including both contract negotiations and law-breaking charges. McDonald’s, particularly in Philadelphia, was the poster boy for proof of that proposition. Predictably, corporations screamed after that 2005 ruling. Last year, the Republican majority on the House Education and the Workforce Committee listened to them and not to workers. It rammed through the anti-joint employer legislation late in 2017. The Senate has yet to act on the issue. Now Trump’s NLRB has followed suit. And his DOL, after yanking Obama’s rule just after Trump took over, is not far behind. “We’re in the process of considering how to provide a more clear and more permanent approach to joint employer,” Acosta said to applause from the American Hotel and Lodging Association, one of the vociferous foes of the Obama-era rule. And Workforce Subcommittee Chairman Bradley Byrne, R-Ala., known for writing many anti-worker anti-union bills, applauded the board’s “important step” which “does not change the fact that we continue to need a permanent legislative solution, like the Save Local Business Act,” his anti-joint employer-rule bill the House passed last year.